Vatican city, 7th of August: The Pope claims men can only find true peace in the Roman Catholic eucharist, believed to be Jesus the Messiah. The Pope deceive the World to believe he represent the Messiah, leading all into sin and blasphemy in the name of Christ. The Roman Catholic’s are told to consume “Jesus”. They literally eat him when they take the Eucharist. Leaving the mass, most of the Catholics continue in their grave sins. There is no change of heart. The reason is simple. You are not saved, by eating a loaf of bread. Rather you become a follower of Jesus by accepting Him into your heart. If you love Him you will promis Him to continue to obey the Word of God. The Roman Catholics claim they participate in the “Holy communion”. Their priests believe they can transform the wine on the table into the literal blood of Jesus. Next, they believe they drink blood. If this was true, why do they refuse their parishioners to drink this blood? When Jesus participated in the last supper, He did not drink his own blood. The Law of God brand drinking of blood as a grave sin. Jesus told his students that they are to remember his blood, and no longer the passover blood shed 1.000 years earlier. Jesus the Messiah shed His blood on the cross at Calvary, once and for all, and replaced the need for blood sacrifices of men. When Jesus shed His blood, no one were told to drink it, and in such a way indulge them selves in satanism and witchcraft. When Evangelical Christians drink the wine in the cup, we remember the death of Jesus on the cross. We promise to stay loyal to His teaching, and obey the messages we receive from the Holy Spirit. 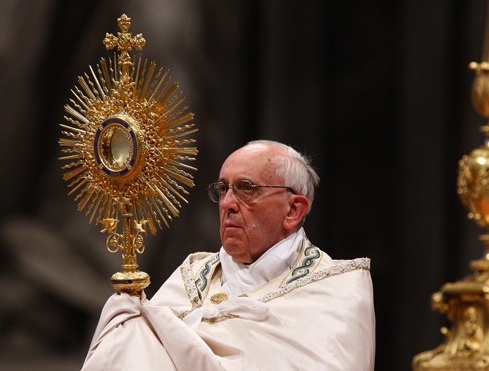 We also reject the false Eucharistic “Jesus-bread” of the Pope. To claim that God can be taken out of heaven, and eaten as a round wafter is pure blasphemy that brings condemnation and judgment. If you want to live and escape the fire of Hell, do not participate in the evils of the Pope. Do not attend the Roman Catholic mass. You better run for your life out of such religious shrines, repent and accept Jesus of the Bible. Remember: I loved you enough to warn you. I am innocent of the blood of all men. Watch a movie on Charismatic pentacostal pastors acceptance of the Papacy. You can’t have peace if you follow this church, it is the devil’s church. It is important to tell he truth. You do. Blessings. Another good article, thank Ivar; heavenly blessings. Thanks for this blessing. It will keep me as a watchman on the walls of both Rome and Jerusalem.